According to Leslie Ament, SVP of research and principal analyst, “Customer data, after all, doesn’t just live in a CRM application; it lives throughout the enterprise. 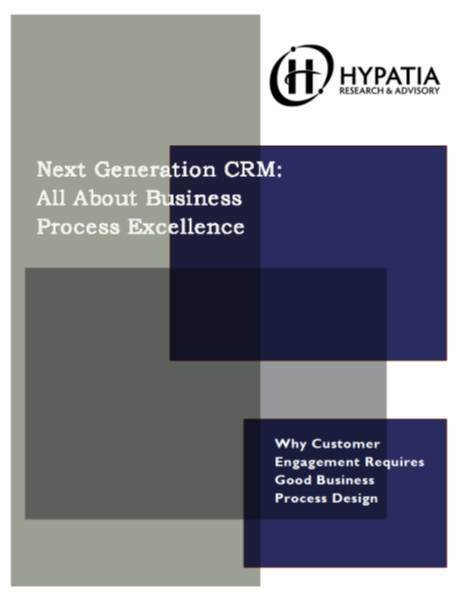 BOSTON - Oct. 8, 2014 - PRLog -- Industry analyst and market research firm Hypatia Research Group (http://www.hypatiaresearch.com/) announces publication of a new primary research study entitled “Next Generation CRM: It’s All About Business Process Excellence (http://hypatiaresearch.com/product/next-generation-crm-all-about-business-process-excellence/)”. Hypatia Research surveyed 800 global executives directly involved with enterprise customer engagement initiatives, software usage and selection criteria. Only the 500 respondents that actually utilize, recommend, influence, hold budget or veto power over the purchase of CRM software were utilized in our analysis. Our due diligence also included a 1) vendor briefings, 2) product demonstration and 3) customer reference interviews. In certain cases, customer references and product demonstrations were obtained without vendor involvement through our professional network. Industry analyst and market research firm Hypatia Research Group (http://www.hypatiaresearch.com/) delivers high impact market intelligence, industry benchmarking, best practice, maturity model and vendor selection research for how businesses use software technology, professional services and management consulting providers to capture, manage, analyze and apply customer and market intelligence to enhance corporate performance and to accelerate growth. Coverage includes: Customer Management (CRM), Business Intelligence, Advanced Analytics, Big Data Insights, Customer Analytics, Social Media, Text Analytics, Digital Marketing, Information Management, Customer Data Management/Data Quality and GRC. Since 2001, clients have relied on Hypatia for industry insight, expertise and independent market research for guidance in assessing various technology and service options. For advisory, licensing (http://www.hypatiaresearch.com/) or further analysis on this topic by company size, industry, job function or geography, please contact Research@HypatiaResearch.com or call 781-862-5106.